China Fakes Craft Beer Bar. BrewDog Responds. What’s Next? Recently, we were tipped off about a “new BrewDog bar” in China. Now, this naturally struck us as quite bizarre considering we don’t have a bar in China, and upon further inspection it would seem that we’ve made it! Someone has opened a fake BrewDog bar! Our initial reaction was bemused, kinda happy, a bit flattered but simultaneously terrified; like a French foie gras goose. Here’s an open letter to the Emperor of this new establishment: Dear (fake) BrewDog China manager/owner/emperor,Thank you. It’s not every day someone pays you the compliment of copying what you do. I mean, I’ll admit we were surprised when we saw a picture of the bar you’ve constructed in our image in Changzhou, and maybe a little terrified, but mainly we were peculiarly proud. There’s something that says ‘you’ve made it’ when a weird replica of your craft beer brand is peddling beers through counterfeit taps somewhere in the world’s biggest country. I honestly cannot wait to visit (fake) BrewDog China. Is there a fake James and Martin we can meet? Because that would be awesome. I know that most organisations might reprimand you, condemn you and maybe even sue you for faking their logo and their bar concept, but speaking as the people normally being slapped on the wrists for rocking the apple cart in this industry, that would smack of hypocrisy. 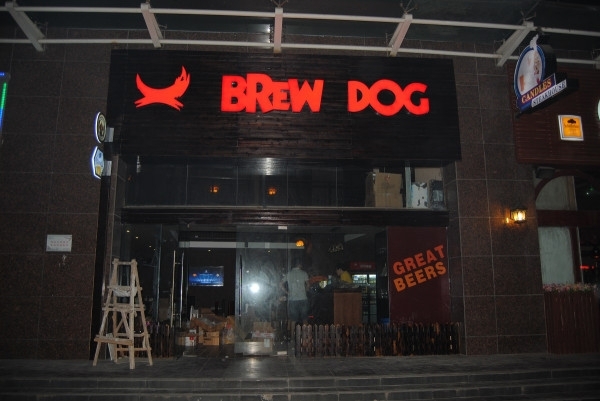 BrewDog exists to make everyone as passionate about beer as we are, and frankly your choice to build a fake BrewDog bar in Changzhou – rather than a fake McDonald’s, a fake Starbucks or a fake Nike Town – suggests to me that we are getting there.